Do you ever just walk through the aisles of Target and find yourself saying "seriously you are killing me Target killing my budget I mean killing me with cute crap treasures I can't live without." 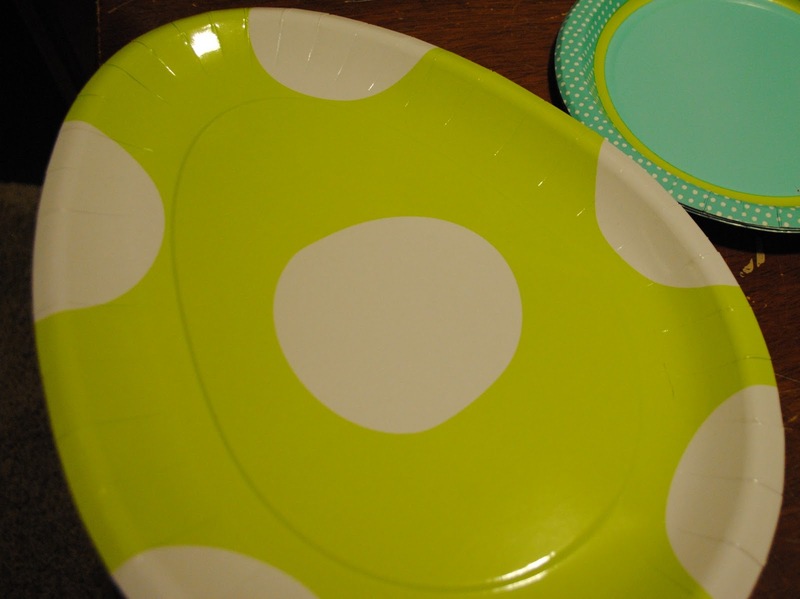 Well that is what happened last week when I saw egg shaped plates. Of course you have to buy that. 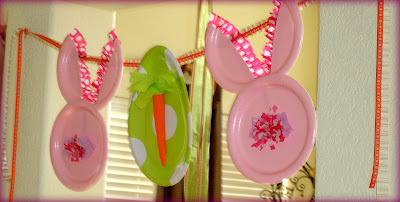 Then I remembered seeing a bunny banner made from paper plates in the magazine Celebrate by Phyllis Hoffman Easter Edition. So Dot and I got busy with paper plates and this is what we came up with. We couldn't leave our plates plain so we added carrots--I already expressed how endearing those little guys are this time of year. And again with the crepe paper. It is so much fun and versatile!! Her bunnies are just too cute on their own and needed their own banner...aren't they so cute!! Ahh, much better! 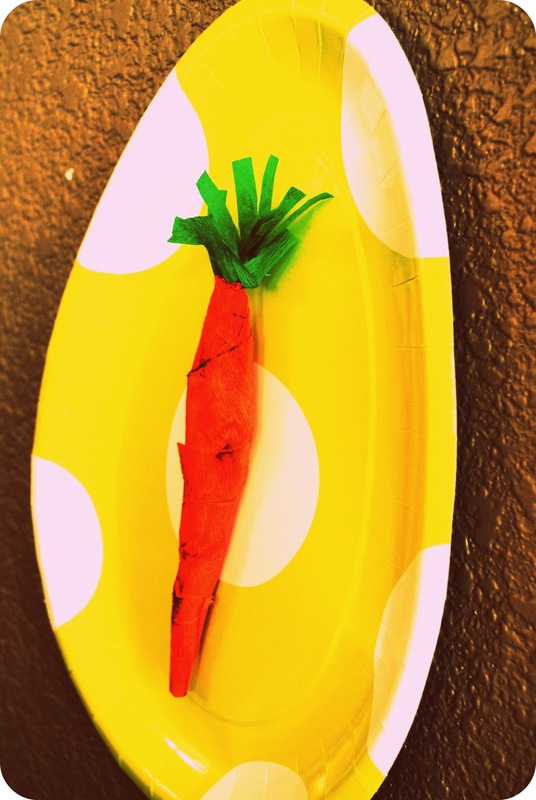 Now the carrots almost look like specimen art! After I hung these I thought to myself that they looked like dinosaur eggs and now that's all I see! But they're staying up! 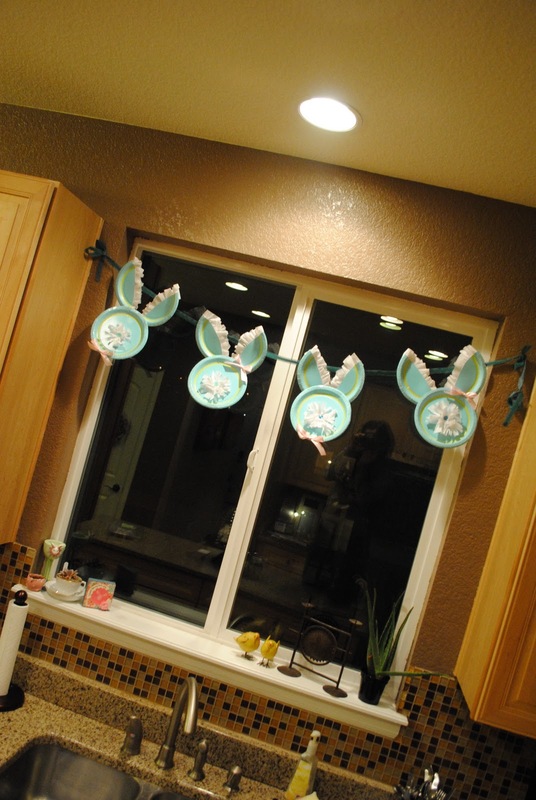 And I just might buy more and use them for a dinosaur birthday party this summer! 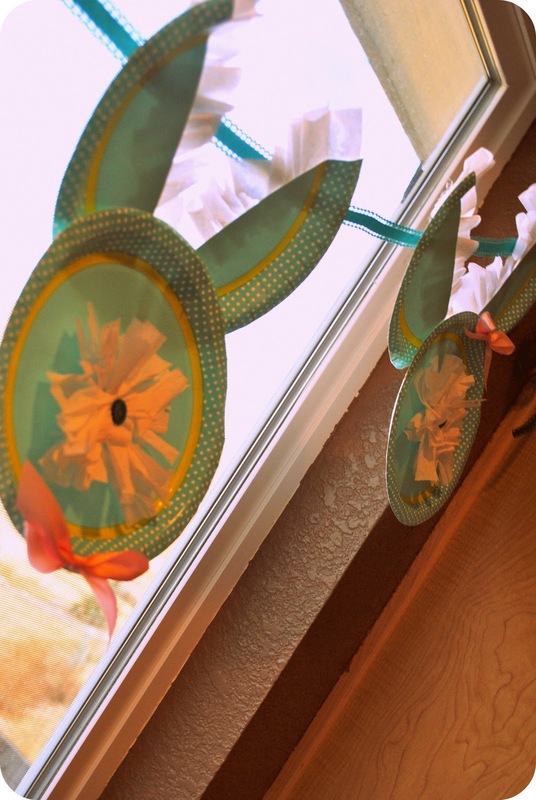 The best thing about these bunnies (besides how cute they are) is how simple they are to make. 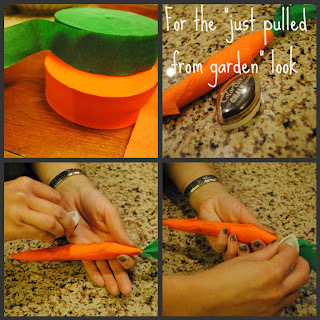 This is really something you can make with your kids. 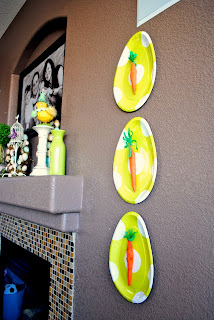 You cut one plate to make the 2 ears, glue them on to another plate and embellish how you wish. So have with this and if you do make a bunny banner we would love to see!! What darling Easter decorations! 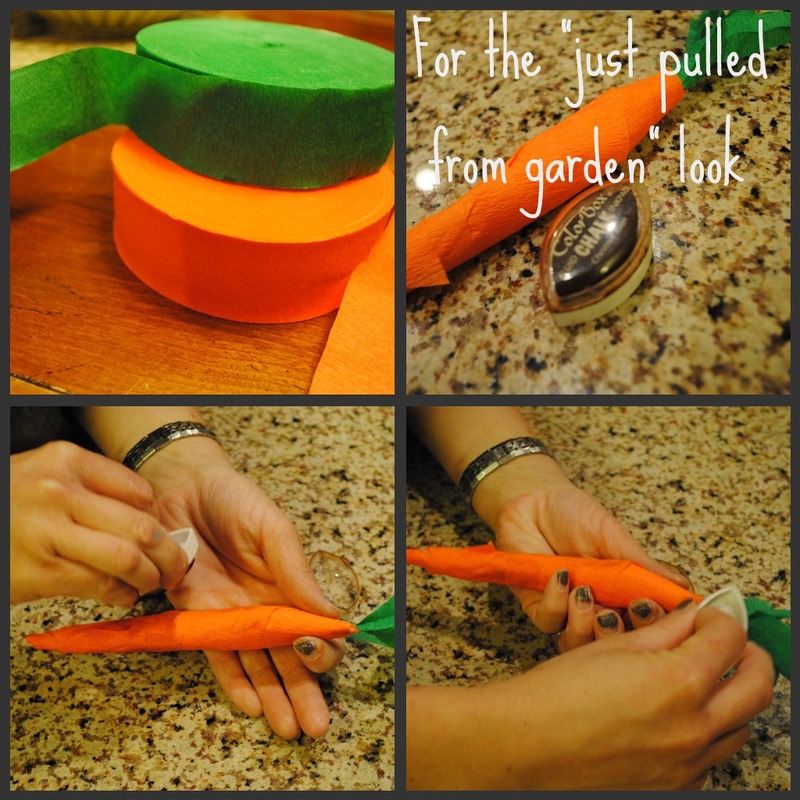 I'm absolutely loving those carrots -- and that is a great idea to save some egg plates for a dinosaur party later in the year! So clever. They look so cute. I saw you at Friday Flair by Whipper Berry. 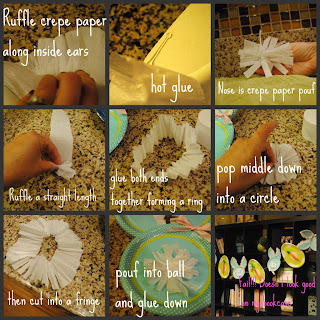 Today is my blog's first linky party. I would love for you to add both: http://koolbeenz-blog.blogspot.com/search/label/Funky%20Fresh%20Fridays. 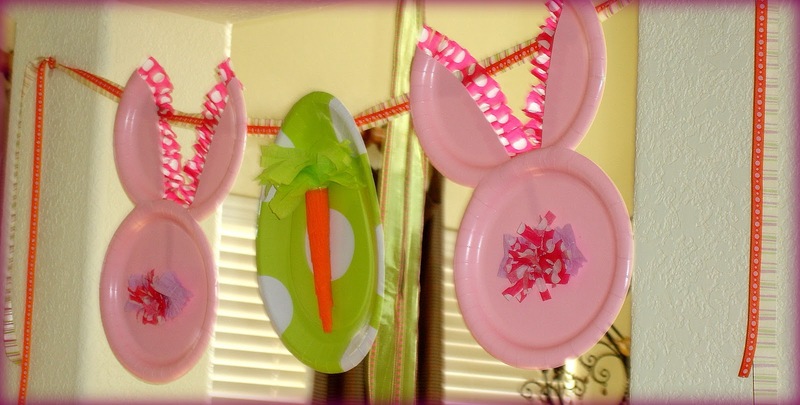 Love the paper plate bunnies! Super creative! Target's always killing my budget. Thanks for a wonderful, affordable project!!! thanks for stopping by and linking up last week. hope to see you back soon. p.s. your blog name is so memorable! Bunny Hop on the Go! What to wear for St. Patrick's Day, and a winner! Next Craft Night, sneak peek! Sweet 16--a really sweet birthday indeed!! Winner of the Sham Glam! !